If you are building a new house or renovating, one way to add charm and character is with solid wood floors, I say "solid" as there are a few other options including engineered wood, however, if you want quality and durability, you can't go past the beauty of solid wood. 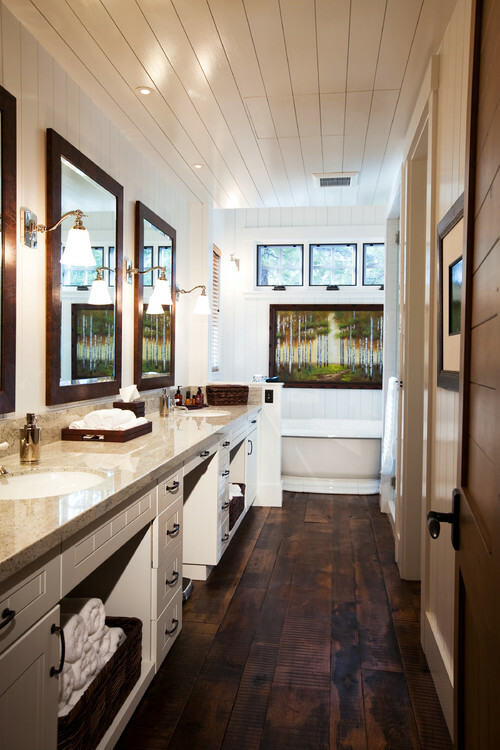 With the many types of wood finishes, I've written this post with hints on selecting the right look for your style of home. Wooden floors have been around for centuries which proves their durability, they add character and warmth that carpet and tiles cannot. 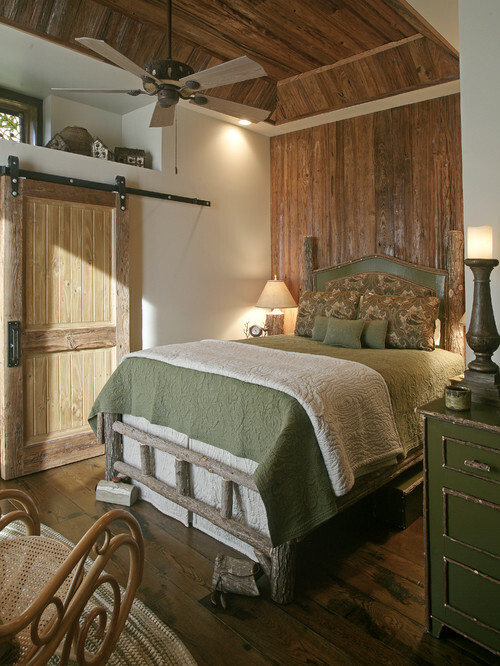 Wooden floors can look rustic or refined depending on the finish you choose. I live in a 1940's brick cottage and lucky enough to have the original solid wood floors which have a durable gloss lacquer. I have lived in the house the past 8 years, it was renovated 4 years earlier, yet our floors are still looking great. The bonus of solid wood floors is that when my varnish eventually wears, the floors can easily be sanded back and varnished again or given a different finish. 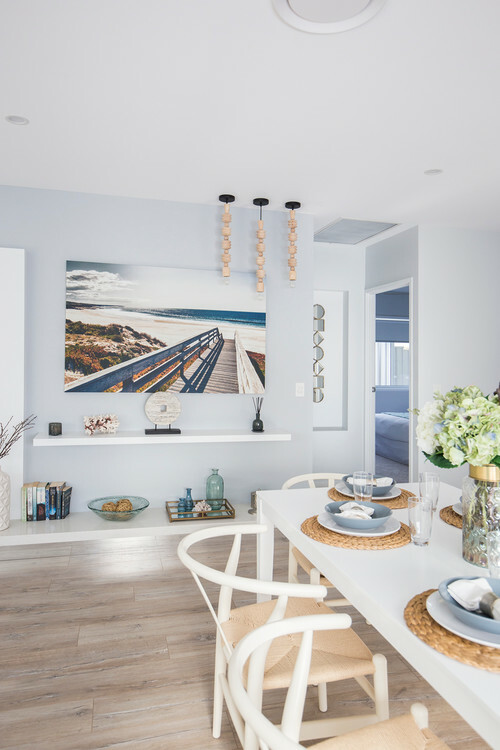 Our beach house however, has engineered wood floors with an oiled appearance, and although visually they look beautiful, they don't have the quality or durability of solid wood flooring. If we need to sand them in the future, there is only a thin slice of the solid wood glued on top of a base plywood, which means it may only be able to be done once. It was a house and land package so at the time I had no choice, however should we build again I will definitely be investing in solid wooden flooring. Above: The engineered wood floors in my beach house are a few mils of solid wood glued to a ply wood, they visually look good, but they are not going to last 100 years and most definitely you can tell the difference in the grain of engineered and solid wood. The colour is washed oak with an oiled finish. 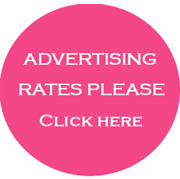 Luxury Flooring and Furnishing Company are UK based and make beautiful solid wood flooring. Their product is, "a natural 100% wood product with each board coming from just one piece of solid wood which is cut down to the desired size, typically between 18 and 25 centimetres. The style of the cut of the wood can vary from flat-sawn, which is the most recognised style with a triangular grain, to rift-sawn where the material is divided up into quarters, then flat-sawn, which gives a finish where the grain is horizontal. After the cutting process is complete, the material is put into a kiln for drying and then finished". I personally believe that you get what you pay for and if you want your floor to last for eternity, then choose solid wood. Once you have decided on a solid wood floor, the choice can be bewildering with the many different woods and finishes, so to help you narrow down your selection whether it be for a carefree beach house or a contemporary city abode I have made some suggestions and included some images to give you an idea of the looks you can achieve. Solid wood floors are an investment so you need to make sure it not only suits the style of your home but also your lifestyle. 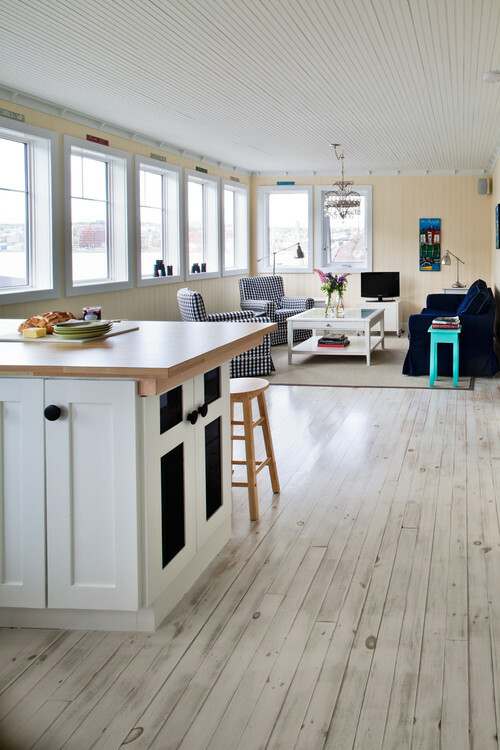 Solid wooden floors look fabulous in a beach house or coastal location. 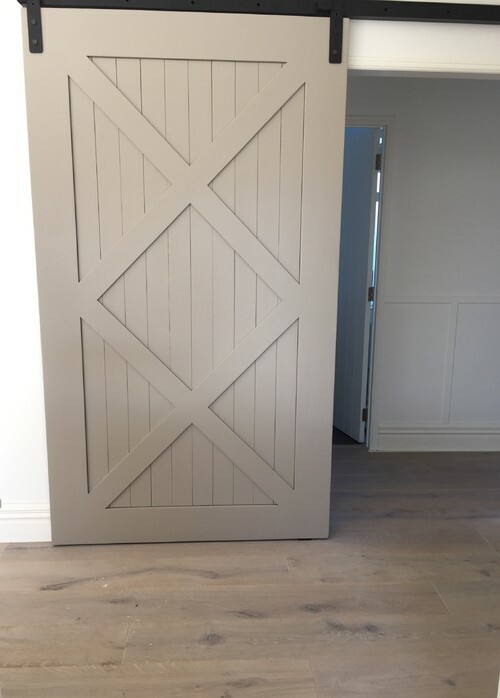 I would advise choosing a light or medium colour, white washed or chalk white boards look gorgeous in beach homes, especially in a washed and brushed oak finish. Lighter or medium toned woods will also make your space feel larger. Dark floor boards can easily show sand and wet marks and drive you crazy. If you have existing floorboards you could have these re-finished by sanding back and white washing to achieve a lighter look, however, sometimes it is less messy to have a new, pre-finished floor laid. As for wide versus narrow, wider floor boards can make a space look bigger, narrow boards are a little more traditional, however they can make spaces feel a little smaller. 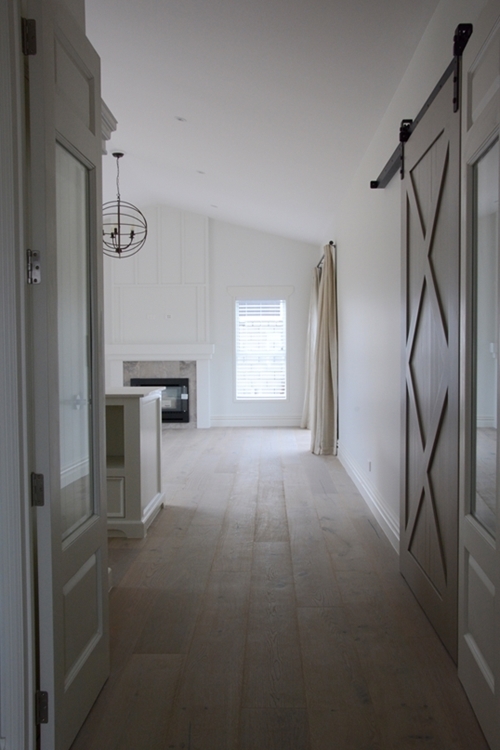 A trick to make a narrow hallway look wider is to run slightly wider boards horizontally across the hallway. If you use narrow boards and run them adjacent to your skirting the hallway will appear longer but narrower. Extra wide boards such as 230 mm should be left for very large, open plan areas. 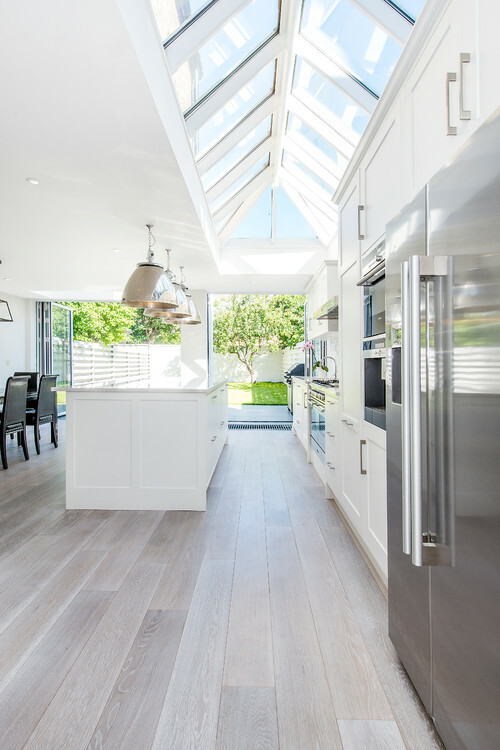 With regards to the finish for a beach house floor, they are more suited to a low sheen lacquer finish, although a lacquer can be damaged by sand on shoes so you could opt for a brushed and oiled finish. I would also suggest for a seaside location you choose floor boards that don't have too much texture or distress so as not to trap sand. A character cottage can take almost any colour floorboard. For a true rustic look you could choose a distressed finish in a medium to dark wood. 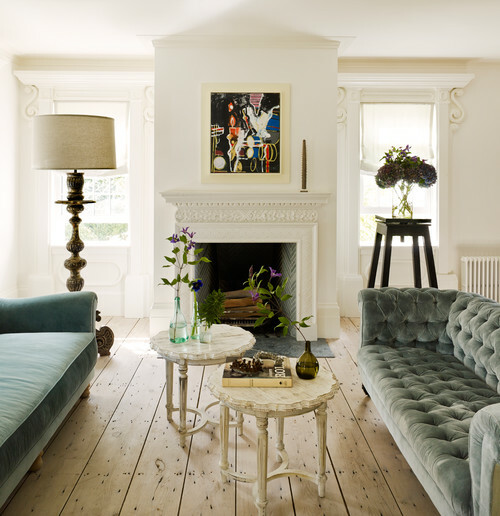 Remember small spaces look better with lighter colours, larger spaces can take both. Personally I am not a fan of "knotty woods", however this style is suited to a city or country cottage. 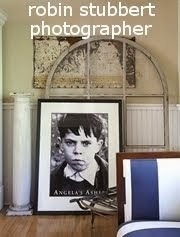 If you like this look think about the size of the room as a lot of knots can look a little busy in a smaller space. A wider board with fewer knots will make a smaller space feel more spacious as long as you don't exceed 180mm. 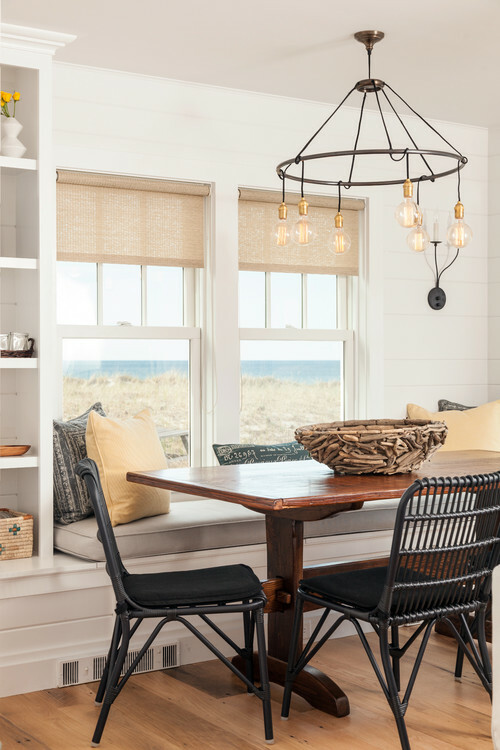 If your cottage is small with little natural light, then I would avoid very dark toned wood, a white washed look will brighten it and make it appear larger. As for the finish, you can choose a distressed look or brushed and oiled for a more traditional finish. A low sheen or gloss finish will look more contemporary. 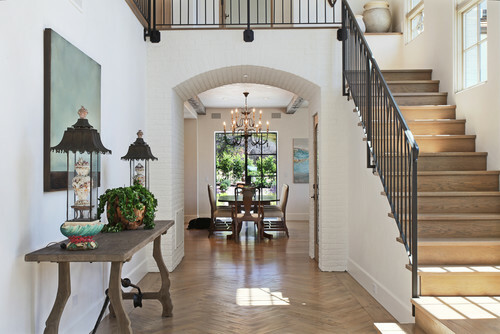 Narrow herringbone can look amazing in a period townhouse or a new build traditional style home. 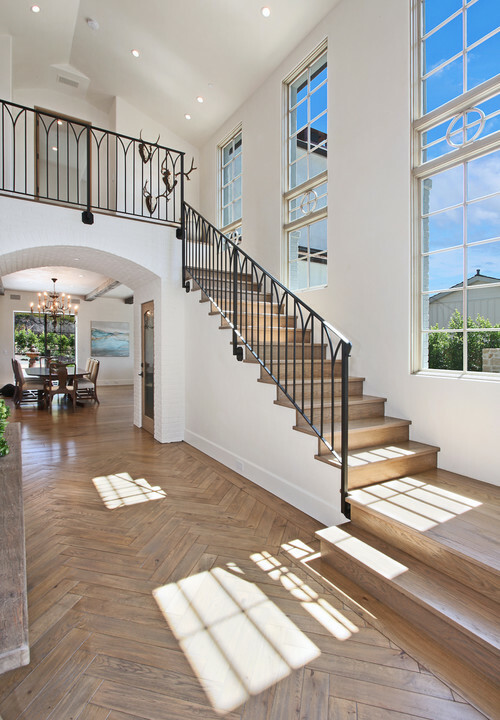 Herringbone comprises of wood of equal size arranged in a zig zag pattern. The pieces are cut in perfect rectangles and then staggered so that the end of one plank meets the side of another. 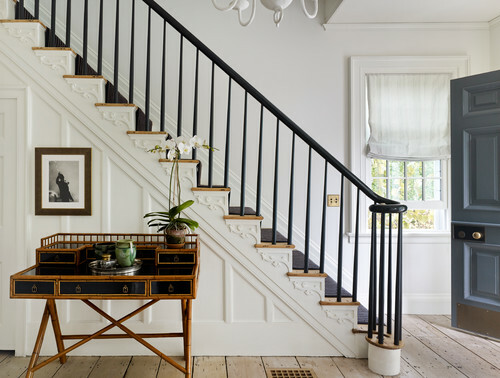 You need not carry the look through the entire house, more of a feature in an entry way or bathroom or a kitchen where you can add a border around the edge. 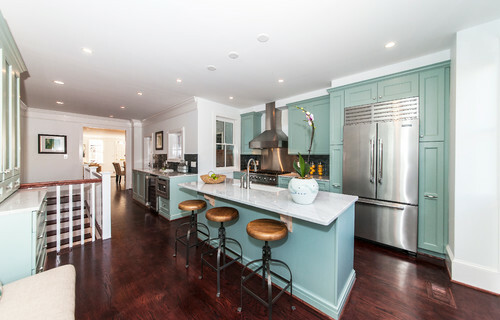 A large, traditional townhouse will look good with light to medium wood in a satin lacquer or brushed and oiled finish. Dark wood can look great too but I would go for a smooth, even toned wood without too much grain, definitely not something too rustic as you want to keep the elegance of a townhouse. 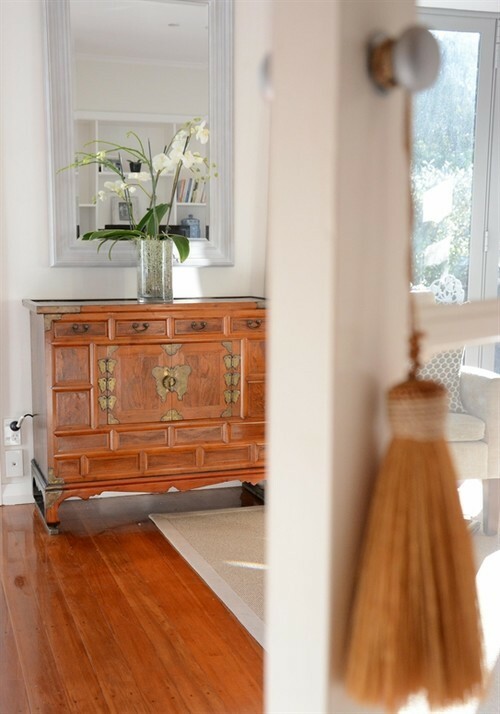 In a minimalist home where there is a lot of space and a white palette, dark wooden floors can look amazing, be prepared for more cleaning as they show dust and dirt quickly, however they do make a fantastic statement. 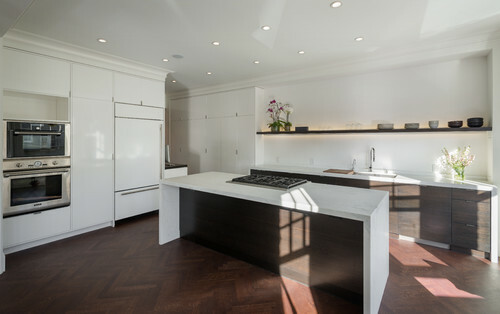 Very dark wood flooring can look beautiful against a white kitchen. 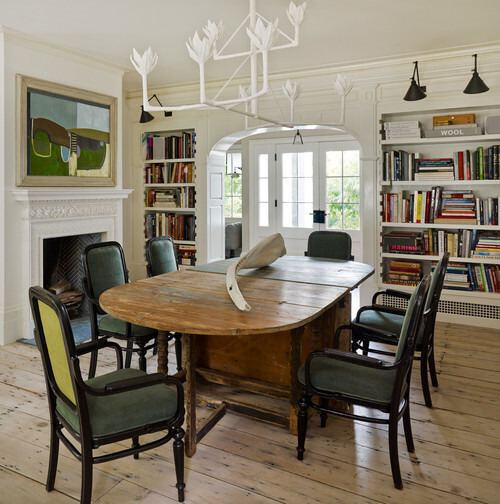 A contemporary home is more suited to the smooth look of a brushed and oiled finish, unless you want a contrast of texture, you may then opt for a rustic look and I would suggest an antique hand distressed finish such as the one below. 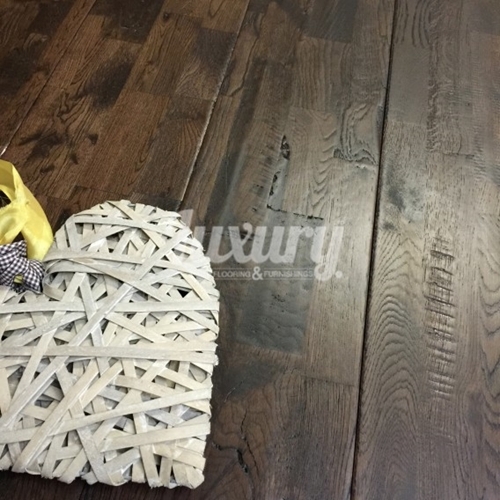 Above: 203mm Antique Hand Distressed solid Oak wooden flooring from Luxury Wood Flooring and Furnishings. 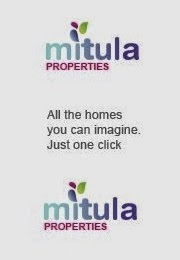 This width looks best in a spacious open plan area, it is not for small rooms. 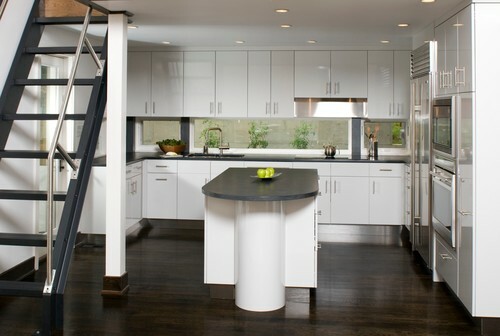 Above: Image via Hingeworks Cabinetry and Construction. 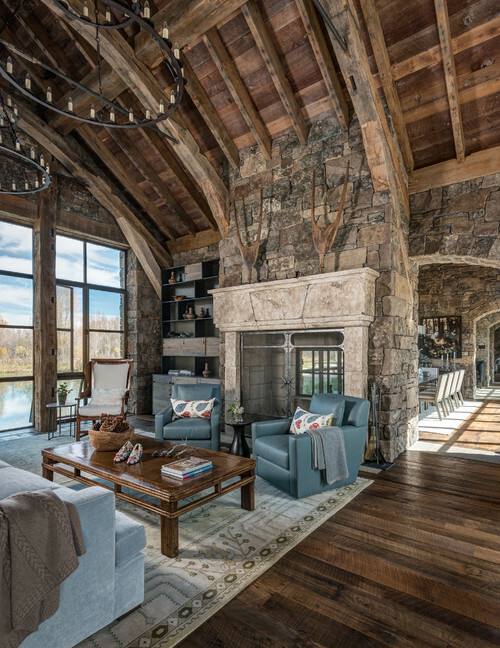 Little needs to be said about this style of home, the answer is in the title, "Rustic", most definitely a mountain or country lodge requires a rustic style floor board. Distressed with differing tones within the wood will look amazing. Tones such as seen below will work with the rustic look of stone and iron. As for the finish, brushed and oiled suits this style of home not so much a gloss look. Above: I love this idea from designer Michael Grant where solid wood has been used as a feature behind the bed, extending onto the ceiling, showing that there is many ingenious ways to use solid wood flooring. There is a myriad of different solid wood finishes, I have only covered a minuscule few, but hopefully I've enlightened you on solid wood flooring and how to select what may work in your home. 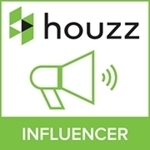 I encourage you to do your homework first, Luxury Flooring and Furnishing Company have a great range of solid wood flooring, their prices are competitive and they ship internationally to most of Europe so they may be a good place to start browsing. This will be my last post for a week, so I wish you all a Merry Christmas and I'll be back just before the New Year.